So we’ve had a Leon in this week for an upgraded intercooler. We supplied one of our Forge units. Decided that we were going to get some figures on how the intercooler really works. I measured intake temperatures airflow and timing pull. With vcds both on the road and on the dyno. My dyno has long ramp up rates I usually have to shorten these to get the correct figures for TFSI’s. it’s ideal to replicate hot ambient temperatures. We first of all logged the car on the dyno. intake temperatures peaked at 47°c and 311hp was measured. Then took the car out on the road intake temperatures got to a much lower 28°c. We then got about fitting the intercooler. Once stripped down we realised the the condenser needed replacing, this stopped us from getting back to back figures on the same day. Following day came around and ambient temperatures within a couple of degrees of the day before. 10 lower than the stock cooler. 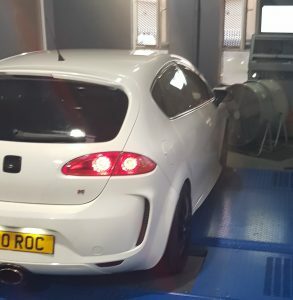 We then strapped the car to the dyno. Intake temperature peaked at 30°C and 328hp was recorded. Pretty close to the original tuners figures. Awesome guy, awesome knowledge, would highly recomend!!!! Fantastic service, really nice people. They worked hard to find an intermittent fault on my VW, and the repair costs were not high. Will be getting my VW serviced here. Cant tell you how refreshing it is knowing theres a garage at hand where they wont have your pants down, very knowledgeable and nothing but friendly, very decent prices for work. Cant say anything else except keep up the good work and i wish them all the best while they grow their fantastic business, aleays recommend to family and friends alike and that was from 1 job he did for me currently in for a new turbo and a remap and i have no worries about it being in the wrong hands. First class experience of work on my Audi. Nothing was too much trouble by Richard and was refreshing to be treated as a valued customer. Very very knowledgeable and a pleasure to put my trust in. Looking forward to taking my car back in a couple of months for a service. Richard even arranged to drop off my car as I was working late. First class service by a true professional company at very reasonable prices. What else can you ask for!! Thanks again Richard and all your team for a fantastic job. Little biased here but it's THE independent alternative for vw Audi seat or skoda.